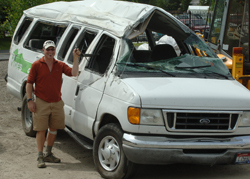 Mountain Rides Operations Manager Jim Finch stands beside a commuter van that was totaled in an accident early Friday evening at Timmerman Junction. There were 15 people involved in the collision but none was seriously injured. County offices will be open Monday through Thursday from 8 a.m. to 6 p.m.